French engraver. He was the younger brother of the engraver Charles Dupuis (1685-1742). He first worked as a dyer and for many years engraved plates of ornaments intended for printing on silk. With his brother he worked in the workshop of Gaspard Duchange, whose daughter he married in 1737; he collaborated with his master in the execution of several large works, including the Coronation of Louis XV); parts of Raphael s cartoons of the Acts of the Apostles (London, Hampton Court, Royal Collection); and Jean de La Fontaine s Fables after Jean-Baptiste Oudry. Dupuis s interpretations of Jean-Baptiste Mass s drawings for La Galerie de Versailles after Charles Le Brun brought him recognition. Mass was so pleased with them that he recommended Dupuis to the Acadmie Royale de Sculpture et de Peinture. He was approved (agr) in 1751 and received (reu) in 1754 with his portrait of Charles-Franois-Paul Le Normand de Tournehem after Louis Tocqu. In 1756 he received a pension for life from Louis XV. At first he worked both at etching and at engraving, but he gradually gave up etching, fearing the effects of the vapours on his health and his sight. His engraving gained in power; his modelling was vigorous, and his backgrounds were sharply defined. He generally signed himself Dupuis Junior or Dupuis le Jeune, to distinguish himself from his brother. His oeuvre, numbering 86 items, is mainly composed of historical subjects: Adoration of the Magi after Veronese; Concert champètre after Giorgione for the Recueil Crozat; Aeneas Rescuing his Father from Burning Troy after Carle Van Loo; genre subjects after Jean-Franois Colson and Johann Elias Zeissig (1737-1806); and amorous scenes, such as Sleeping Nymph with Satyrs after Louis Chron and Youthful Amusements after Franois Eisen. 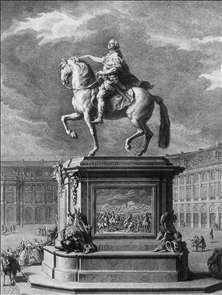 See more details about "Equestrian Statue of Louis XV at Bordeaux"